From the first mention of her in Darth Vader #2 (Vol. 1) to her first appearance in Darth Vader #3, Doctor Chelli Lona Aphra has been among the standout and stalwart Star Wars comics characters, a fast fan favorite. 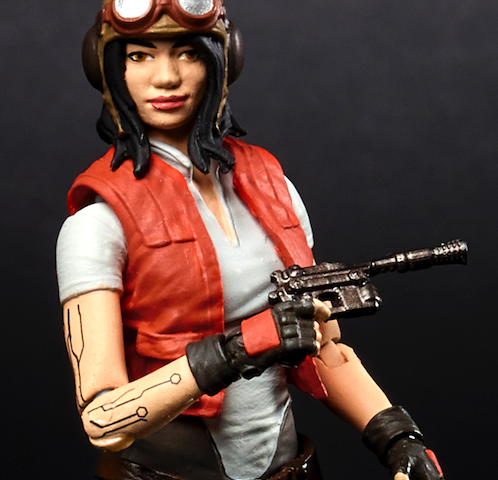 Since her early 2015, debut, Aphra’s has only gained interest and fans, sparking devoted cosplay, passionate readers and so much more, given her relationships, moral ambiguity about doing right and wrong and knack for adventure. As such, it was not much of a surprise that fans supported her as a 3-3/4″ Black Series action figure in a Hasbro poll. Now we know what she’ll look like after the company revealed the figure at the 2018 American International Toy Fair that was held Feb. 17-20 in New York and we’re excited about it the addition of the character to the line. It’s a big step for the Kieron Gillen-created character, the first of what we hope will be many more achievements.